Jeanne and I recently traveled to the most remote island of the British Virgin Islands—Anegada. Most mornings, we were the only people on the beach at the Anegada Beach Club. The beaches here are the most beautiful we have ever experienced with white sand and crystal clear water loaded with coral and grass beds. Unfortunately, there is one creature, endemic to the region that hangs on edge of extinction. The Earth’s fourth-largest coral reef surrounds Anegada. Queen Conchs (large sea snails) comb the seabeds for grass by the thousands. Once hunted to extinction on the island in the 60s, Carribean flamingos now flourish. This is the last place on Earth where the critically-endangered Anegada Rock Iguana is making a sustained comeback in the wild. 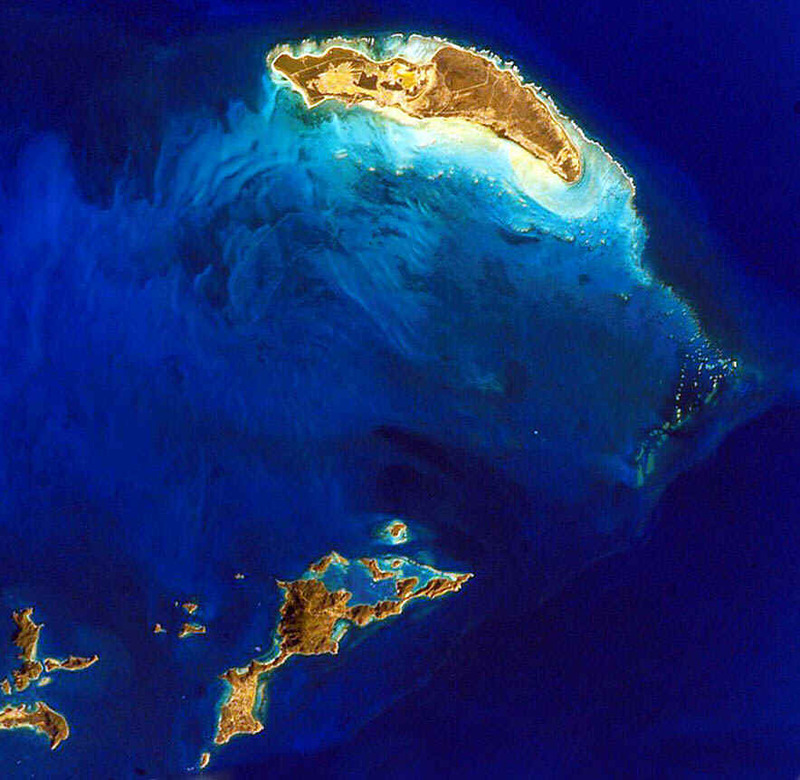 Satellite image of Anegada (top) and Virgin Gorda (bottom) taken from the International Space Station. The Earth’s fourth-largest coral reef surrounds the island. 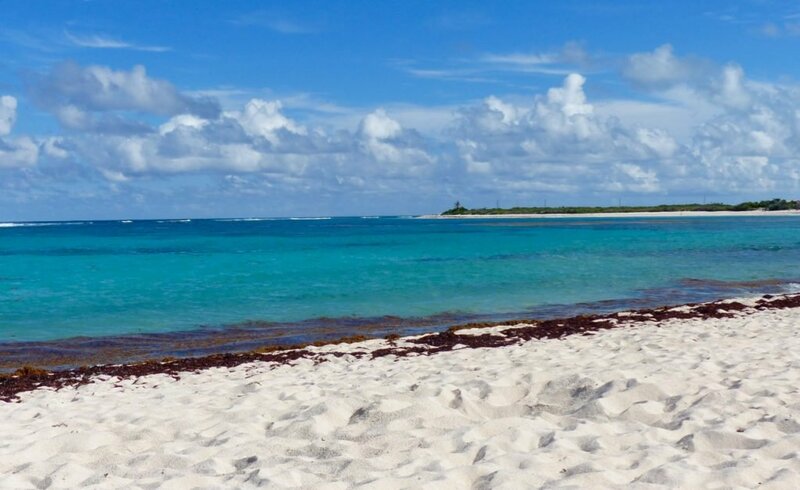 Columbus named this low-lying, limestone island Anegada, which means “drowned land.” The highest elevation of this fifteen-square-mile island is only twenty-eight feet. The coral reef and grass beds teem with fish, lobster, and conch. The Carribean Spider Lobster and the Queen Conch are the main local dishes. We ate conch every day…conch fritters, coconut cracked conch or conch ceviche. Sherwin Walcott, who we met on the ferry from Tortola to Anegada took us out on his boat for an afternoon outing. Horseshoe Reef was our destination where we snorkeled and dove for conchs. He taught us how to harvest the snail and prepared ceviche with his “special sauce” right on the boat. It was the best we have ever eaten. The Anegada Conch Mound is a must-see destination. 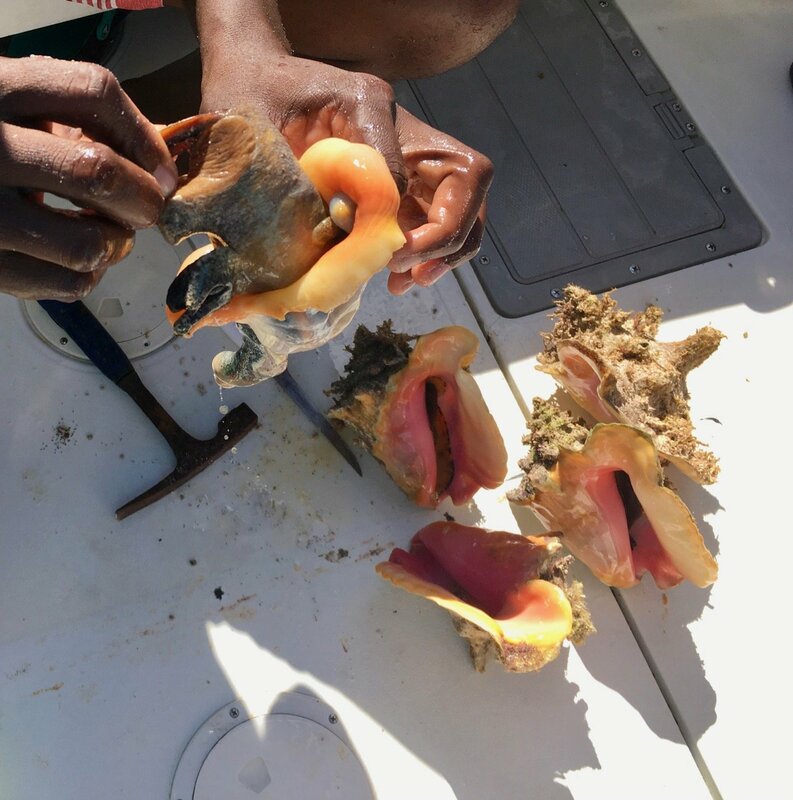 Located near the eastern edge of the island it is where fishermen have been discarding their conch shells for over a hundred years. 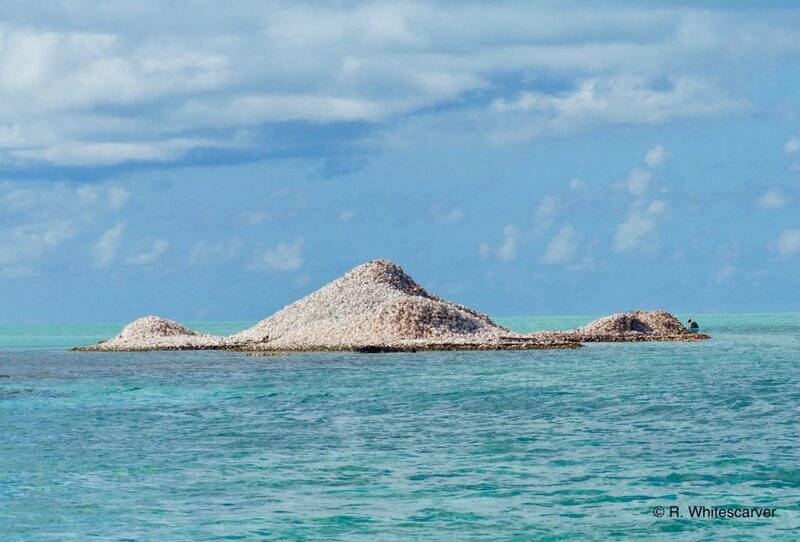 The Anegada conch mound. Yes, those are conch shells. Photo by R. Whitescarver. The Carribean Flamingo was hunted to local extinction in the 1960s. In 1992 The Conservation Agency led by Dr. Numi Michell and James Conyers released several flamingos from Bermuda into the salt ponds of the island. The birds flourished and today there are several hundred. Humans took them out, humans brought them back. With understanding, science, and passion we can bring back most anything. 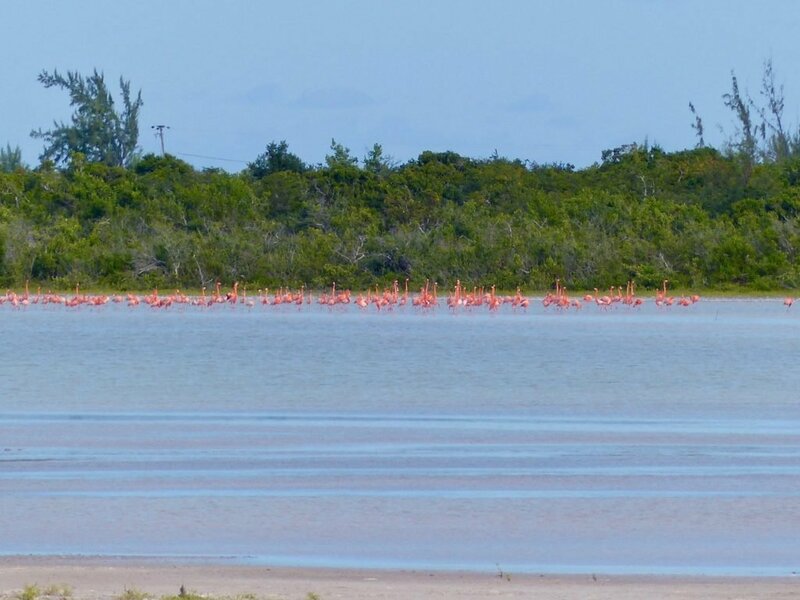 Flamingos were once hunted to local extinction on Anegada. Now, thanks to conservation efforts they are coming back. Photo by R. Whitescarver. I’ve got this thing about free-roaming cats. We are on this remote beautiful island on vacation and wouldn’t you know it, free-roaming cats are the number one reason the Anegada Rock Iguana is critically-endangered. Cats kill juvenile iguanas. And since the Queen of England took possession of most of the land on the island in the 1960s farmers let their fences go. As a result, all their livestock including goats, sheep, cows, and donkeys roam free, eating the vegetation needed by the iguanas for survival. The endemic Anegada Rock Iguana in captivity at the Iguana Headstart facility. Photo by R. Whitescarver. Scientists, naturalists, and iguana enthusiasts have charted a comeback for the endemic iguana. Entrance to the Anegada Iguana Headstart Facility. Photo by R. Whitescarver. 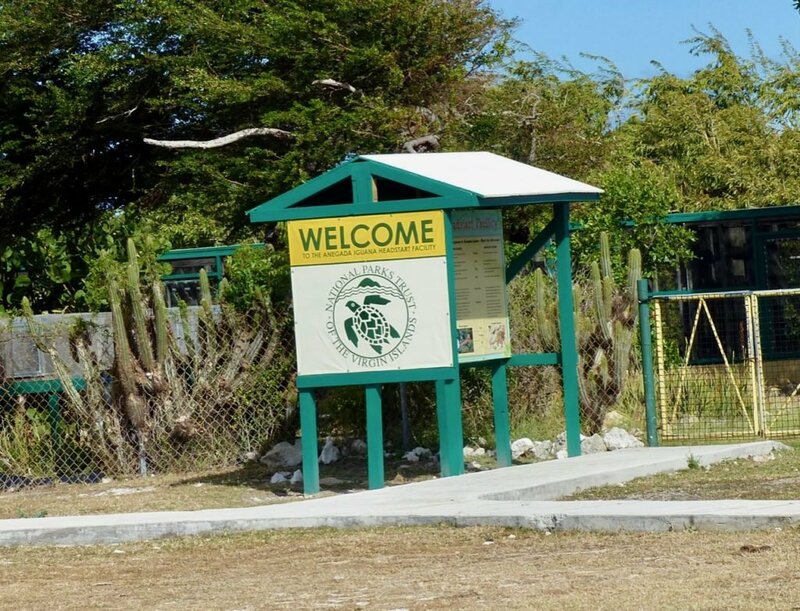 The National Parks Trust of the Virgin Islands in partnership with many organizations including the San Diego Zoo and the Fort Worth Zoo established the Anegada Iguana Headstart facility on the island. Hatchlings and juveniles are captured in the wild, transferred to the facility and raised in cages. When the adults reach a weight of 14 ounces they are released back into the wild. In the 1980s eight adult iguanas were captured on Anegada and transferred to the BVI island of Guana. Offspring have been sighted but there are fears of inbreeding. The San Diego Zoo maintains a small population as a hedge against extinction in the wild. “Cats, rats, and goats are the most destructive invasive species worldwide, and particularly so for islands. Unfortunately, Anegada has them all. The natural mortality rate of hatchling iguanas is close to 50%, so adding an additional predator, especially one as efficient as a cat, has resulted in almost no recruitment in this population. Today the headstart program is the main source for new individuals being added to the population,” states Kelly Bradley, Conservation Biologists with the Fort Worth Zoo. There is a Species Recovery Plan with many recommendations. Establishing a national park, eliminating the free-roaming cat population, and livestock containment are a few of the major recommendations. There is also an excellent environmental profile about Anegada. Cats are perhaps the most destructive, non-native mammal on Anegada and in North America. Worldwide they are responsible for the extinction of sixty-three species, including the Stephens Island Wren. Endemic-species on islands are especially vulnerable to the impacts of invasive species. 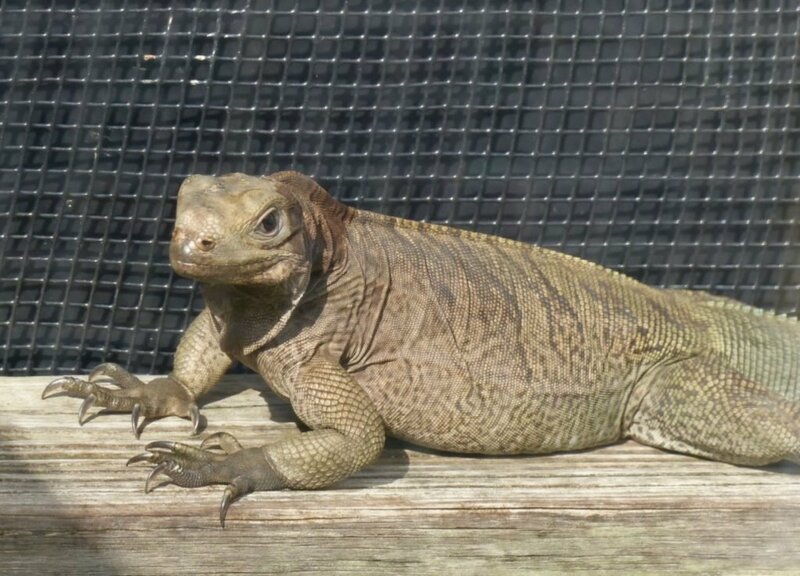 Humans caused the demise of the Carribean Flamingo on the island and cats are now causing the demise of the Anegada Rock Iguana. We can restore sustainable populations threatened and endangered species with the help of science, passionate people, and dedicated organizations. Please help these initiatives with your talents and contributions. Conservation issues on islands amplify the same issues we have on larger landscapes. For example, we now know that the domestic cat is responsible for the death of billions of birds annually in North America. Cats and other free-roaming domestic animals are a global issue. It is time to come to grips with it. All cats must be indoor cats and domestic livestock must be contained. The post Anegada: Beautiful Beaches, Queen Conchs, Iguanas and…Cats appeared first on Getting More on the Ground.